Conventional Spinal Cord Stimulation. Goebel A, Lewis S, Philip R, Sharma M. Pain Practice 2017 (in press). Fibromyalgia in Behcet’s Disease: A Narrative Review. Jobanputra C, Richey RH, Nair J, Moots RJ, Goebel A. British Journal of Pain 2017 (in press). Johnson S, Richey R, Holmes E, Hughes D. Goebel A, A randomised, patient-assessor blinded, sham-controlled trial of external non-invasive peripheral nerve stimulation for chronic neuropathic pain following peripheral nerve injury (EN-PENS trial): study protocol for a randomised controlled trial. Trials. 2016;17(1):574. Goebel A. Autoantibody pain. Autoimmunity Reviews 2016; 15(6): 552-7. Reilly JM., Dharmalingam B., Marsh SJ., Thompson V., Goebel A* and Brown D*. Effects of serum immunoglobulins from patients with Complex Regional Pain Syndrome (CRPS) on depolarization-induced calcium transients in isolated dorsal root ganglion (DRG) neurons. Experimental Neurology 2016, March: 277:96-102 *joint senior authors. Aradillas E., Schwartzman R.J., Grothusen J.R., Goebel A., Alexander G.M. Plasma exchange therapy in patients with Complex Regional Pain Syndrome. Pain Physician 2015, 18(4):383-94. Goebel A., Jayaseelan A., Bhagwat K., Gupta M., Frank B. Racemic Ketamine 4.5 day Infusion for the treatment of longstanding Complex Regional Pain Syndrome. British Journal of Anaesthesia 2015, 115(1): 146-7. Osborne A., Farrell J., Dearman R.J., MacIver K., Naisbitt D.J., Moots R.J., Edwards S.W., Goebel A. Cutaneous Immunopathology of Longstanding Complex Regional Pain Syndrome. European Journal of Pain 2015; 19(10):1516-1526. Mbizvo G., Nolan S., Nurmikko T., Goebel A. Placebo responses in longstanding Complex Regional Pain Syndrome: a systematic review and meta-analysis. Journal of Pain 2015; 16(2): 99-115. Goebel A. Immune activation and autoimmunity in chronic pain conditions and response to immunoglobulin G. Clinical and Experimental Immunology 2014; 178(S1): 39-41. Goebel A. Cellular and behavioral models to predict responses to immunoglobulin G treatment in complex regional pain syndrome. Clinical and Experimental Immunology 2014; 178(S1): 136-137. Dubuis E., Thompson V., Leite M., Blaes F., Maihoefner Ch., Greensmith D., Shenker N., Kuttikat A., Leuwer M., Goebel A. Longstanding Complex Regional Pain Syndrome is associated with activating autoantibodies against α-1a adrenoceptors. Pain 2014; 155: 2408 – 2417. Benson J., Spencer M., Goebel A., Munglani R.. Compensation Claims Relating to Chronic Pain – Parts 1-5. Journal of Observational Pain Medicine 2014; 1(4). Goebel A., Jones S., Oomman S., Callaghan Th., Sprotte G. Treatment of Longstanding Complex Regional Pain Syndrome with Therapeutic Plasma Exchange; a Preliminary Case Series of Patients Treated 2008-2014. Pain Medicine 2014; 15(12): 2163-4. Johnson S., Ayling H., Sharma M., Goebel A. External Non Invasive Peripheral Nerve Stimulation Treatment of Neuropathic Pain, a Prospective Audit. Neuromodulation 2015; 18(5): 394-91. Goebel A., Shenker N., Padfield N., et al. Low-dose Intravenous Immunoglobulin Treatment for Complex Regional Pain Syndrome – Study Protocol. Trials 2014; Oct 15:404. Birley T, Goebel A. Widespread Pain in Patients with Complex Regional Pain Syndrome. Pain Practice 2014; 14(6): 526-31. Goebel A. Current Understanding of the Causes of Complex Regional Pain Syndrome (CRPS), with its Medico-Legal Implications. Journal of Observational Pain Medicine 2014; 1(3). Gupta M., Goebel A. Unexplained nausea and weight loss in two cases of Complex Regional Pain Syndrome. Pain Medicine 2013; Nov14(11):1806-07. Goebel A., Mishbah S., McKiver K., Haynes L., Burton J., Philips C., Frank B., Poole H. Immunoglobulin Maintenance Therapy in Longstanding Complex Regional Pain Syndrome, an Open Study. Rheumatology 2013; 52(11): 2091-93. Goebel A. The Management of Adult Patients with Longstanding Complex Regional Pain Syndrome. Pain Management 2013; 3(2): 1-10. Goebel A, Blaes F. Complex Regional Pain Syndrome, Prototype of a Novel Kind of Autoimmune Disease. Autoimmunity Reviews, 2013; 12(6): 682-6. Goodson NJ, Smith BH, Hocking LJ, McGilchrist MM, Dominiczak AG, Morris AD, Porteous DJ, Goebel A. Cardiovascular risk factors associated with the metabolic syndrome are more prevalent in people reporting chronic pain: results from a cross sectional general population study. Pain 2013; 154(9): 1595-602. Cossins L, Okell RW, Cameron H, Simpson B, Poole HM, Goebel A. Treatment of Complex Regional Pain Syndrome in adults: A systematic review of randomised controlled trials published June 2000 to April 2012. EuJPain 2013; 17(2):158-73. Goebel A, Lecky B, Smith LJ, Lunn M. Pain intensity and distribution in chronic inflammatory demyelinating polyneuropathy. Muscle & Nerve 2012; 46(2): 294-295. Goebel A. Morphine and Memantine Treatment for CRPS. Pain Medicine 2012; 13(3): 357-8. Johnson S, Hall J, Barnett S, Draper M, Derbyshire G, Haynes L, Rooney C, Cameron H, Moseley G L, Williams A C de C, McCabe C, Goebel A. Using Graded Motor Imagery for Complex Regional Pain Syndrome in clinical practice: failure to improve pain. Eur J Pain 2012;6:550-561. Kohr D, Singh P, Tschernatsch M, Kaps M, Pouokam E, Diener M, Kummer W, Birklein F, Vincent A, Goebel A, Wallukat G, Blaes F. Autoimmunity Against the β(2) adrenergic Receptor and Muscarinic-2 receptor in Complex Regional Pain Syndrome. Pain 2011; 152:2690-700. Goebel A, Leite MI, Yang L, Deacon R, Cendan CM, Lewis A, Vincent A. The passive transfer of IgG Serum Autoantibodies from Patients with Complex Regional Pain Syndrome. Eur J Pain 2011; 15(5):504.e1-6. Goebel A, Lecky B, Smith LJ, Lunn M. Pain intensity and distribution in chronic inflammatory demyelinating polyneuropathy. Muscle & Nerve 2012 (in press). MacIver K, Sacco P, Nurmikko T. The role of mental imagery in chronic pain and its effect on cortical reorganisation. In:Knotkova H, Cruciani RA, Merrick J e(ds. ), Neural Plasticity in Chronic Pain. Nova Science, 2011. Turner-Stokes L., Goebel A. Complex Regional Pain Syndrome in Adults: Concise Guidance for the UK. Clin Med 2011;11: 596-600. Robinson G, Cohen H, Goebel A. A case of complex regional pain syndrome with agnosia for orientation. Pain 2011;152:1674-1681. Haanpää M, Attal N, Backonja M, Baron R, Bennett M, Bouhassira D, Cruccu G, Hansson P, Haythornthwaite JA, Iannetti G, JensenTS, Kauppila T, Nurmikko TJ, Rice ASC, Rowbotham MC, Serra J, Sommer C, Smith BH, Treede R-D. NeuPSIG guidelines on neuropathic pain assessment. Pain 2011; 152:14-27. Stancak A, Alghamdi J, Nurmikko TJ. Cortical activation changes during repeated laser stimulation: a magnetoencephalographic study. PLoS One 2011; 10;6:e19744. Goebel A, Leite MI, Yang L, Deacon R, Cendan CM, Fox-Lewis A, Vincent A. The passive transfer of immunoglobulin G serum antibodies from patients with long standing Complex Regional Pain Syndrome. Eur J Pain 2011;15:504.e1-6. Hunter T, Sacco P, Turner DL. Changes in excitability of the motor cortex associated with internal model formation during intrinsic visuomotor learning in the upper arm. J Behav Brain Sci 2011 (in press). Mbizvo G, Powell A, Sacco P, Nurmikko T. Navigated transcranial magnetic stimulation mapping of the primary motor cortex in patients with Complex Regional Pain Syndrome: a pilot study. Clin Neurophysiol 2011;122 (Supplement 1): S199. Sacco P, Prior M, Poole H, Nurmikko T. Effects of repetitive transcranial magnetic stimulation on experimental hyperalgesia in healthy subjects. Clin Neurophysiology 2011;122 (Supplement 1): S199. Goebel A,.Dutoit N, Prerez J, Huygen F. Anesthesiologists’ views on using immune modulating drugs in pain medicine. Pain Pract 2011;1:344-352. Nurmikko TJ, Kelly S. Change the brain to change the pain. BackCare Journal 2010 Spring:26-27. Evans J, O’Neill F, Dunn A. Fracture of atlas with congenital posterior mid-line cleft. EuroRad 2010, June 16. DOI: 10.1594/EURORAD/CASE8435. MacIver K, Sacco P, Nurmikko T. Cortical reorganisation, mental imagery and pain. Journal of Pain Management 2011; 4:00-00. MacIver K, Sacco P, Nurmikko T. The role of mental imagery in chronic deafferentation pain and its effect on cortical reorganisation. In: Helena Knotkova, Ricardo A Cruciani and Joav Merrick (eds). Neural plasticity in chronic pain. New York, Nova Science, 2011(in press). Haanpää M, Attal N, Backonja M, Baron R, Bennett M, Bouhassira D, Cruccu G, Hansson P, Haythornthwaite JA, Iannetti G, JensenTS, Kauppila T, Nurmikko TJ, Rice ASC, Rowbotham MC, Serra J, Sommer C, Smith BH, Treede R-D. Reply to the Letter to the Editor. Pain 2011;152:1683-1684. Hunter T, Sacco P, Nitsche MA, Turner DL. Modulation of internal formation during force field-induced motor learning by anodal transcranial direct current stimulation of primary motor cortex. J Physiol. 2009;587:2949-61. Poole H, White S, Blake C, Murphy P, Bramwell R. Depression in chronic pain patients: prevalence and measurement. Pain Pract. 2009;9:173-80. Poole H, Bramwell R, Murphy P. The utility of the Beck Depression Inventory Fast Screen (BDS-FS) in a pain clinic population. Eur J Pain. 2009;13:865-9. Turner D, Sacco P, Hunter T. Complex motor cortex control of muscle synergies underpin simple reaching tasks in robot-induced force field. Proceedings of the UKACC International Conference on Control 2008 (ISBN 978-0-9556152-1-4). Eadsforth, T. Magnetic Resonance Spectroscopy and Diffusion in the Lumbar Disc: a study of feasibility in patients and healthy volunteers. MPhil Thesis (University of Liverpool 2009). Goebel A. Immunoglobulin responsive pain. J Clin Immunol. 2010;30 Suppl 1:S103-S108. MacIver K and Lloyd D. Management of phantom limb pain. In: Murray C, (ed), Amputation, Prosthesis Use, and Phantom Limb Pain. Springer New York 2010, pp. 157-173. Nurmikko T, Gupta S, MacIver K. Multiple sclerosis-related central pain disorders. Curr Pain Head Rep 2010;14:189-195. Haanpaa M, Attal N….Nurmikko T, …Treede R-D. NeupSIG guidelines on neuropathic pain assessment. Pain 2011; 152:14-27. Goebel A, Baranowski A, Maurer K, Ghiai A, McCabe C, Ambler G. Intravenous immunoglobulin treatment of the complex regional pain syndrome: a randomized trial. Ann Intern Med. 2010;152:152-8. Lloyd D, Findlay G, Roberts N, Nurmikko T. Chronic low back pain: illness behaviour is associated with activity in the affective circuitry of the brain. Spine 2008;33:1372-1377. MacIver K, Lloyd DM, Kelly SC, Roberts N, Nurmikko T. Phantom limb pain, cortical reorganisation and the therapeutic effect of mental imagery. Brain 2008;131:2181-2191. Mason L, Poole HM. Health professionals views of screening for postnatal depression using the EPDS. Community Practitioner. 2008;81: 30-33. Richardson C, Glenn S, Horgan M, Nurmikko T. A prospective study of factors associated with the presence of phantom limb pain six-months after major lower limb amputation in patients with peripheral vascular disease. J Pain 2007;8:793-801. Rog D, Nurmikko T, Young C. Oromucosal Δ9-tetrahydrocannabinol/cannabidiol for neuropathic pain associated with multiple sclerosis: an uncontrolled, open-label, 2-year extension trial. Clin Ther 2007;29:2068-2079. Nurmikko TJ, Serpell MG, Hoggart B, Toomey PJ, Morlion BJ, Haines D. Sativex successfully treats neuropathic pain characterised by allodynia: a randomised placebo controlled double-blind trial. Pain 2007;133:210-220. Rog D, Nurmikko T, Friede T, Young C. Validation and reliability of the neuropathic pain scale (NPS) in multiple sclerosis. Clin J Pain 2007;23:473-481. Shapiro KL, Johnston SJ, Vogels W, Zaman A, Roberts N. Increased functional magnetic resonance imaging activity during nonconscious perception in the attentional blink. Neuroreport 2007;18:341-345. Sterr A, Shen S, Zaman A, Roberts N, Szameitat A. Activation of SI is modulated by attention: a random effects fMRIO study using mechanical stimuli. Neuroreport 2007;18:607-611. Kelly S, Lloyd, D, Nurmikko T, Roberts N. Retrieving autobiographical memories of painful events activates the anterior cingulate cortex and inferior frontal gyrus. J Pain 2007;8:307-314. Lloyd D, Morrison I, Roberts N. Role for human posterior parietal cortex in visual processing of aversive objects in peripersonal space. J Neurophysiol 2006;95:205-214. Poole, HM, Bramwell R, Murphy P (2006) Psychometric properties of the BDI-II in patients with chronic pain. Clin J Pain 2006;22:790-798. Richardson C, Glenn S, Nurmikko TJ, Horgan M . The incidence of phantom phenomena including phantom limb pain six-months after major lower limb amputation in patients with peripheral vascular disease. Clin J Pain 2006;22:353-358. Dean J, Bowsher D, Johnson MI. The effects of unilateral transcutaneous electrical nerve stimulation of the median nerve on bilateral somatosensory thresholds. Clin Physiol Funct Imaging. 2006;26:314-8. Bowsher D. Somatic sensation and the insular-opercular cortex: relationship to central pain.Eur Neurol. 2006;55:160-5. 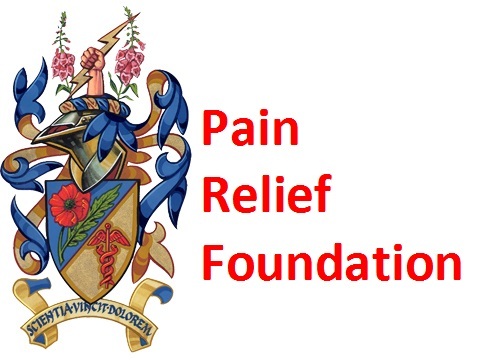 The Pain Research Institute receives no funding from the NHS, the University or any other government body. It is entirely supported by charitable donations, fund raising and specific research grants.